Fire suppression is the job that most people think of when they think of firefighters--putting out fires. Fire suppression is the primary task of the fire department--if it's burning and it's not supposed to be, it's our job to put it out in the safest and timeliest manner while minimizing loss of life and property. It is a task that requires planning, teamwork, readiness, knowledge, and equipment. The fire department has standard operating guidelines that help to guide the actions of officers and firefighters in the event of a fire. Strategies, tactics, and techniques are all practiced and discussed regularly at drills and meetings. 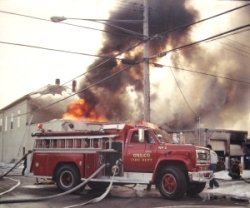 For businesses in town, the department maintains pre-incident plans that detail building layout, occupancy information (how the building is used, what it likely contains, and whether or not we should expect people to be present at a given time), possible complications, and other valuable information to have in hand in the event of a fire. Fighting fires is a difficult and dangerous activity. To minimize risk and achieve the highest efficiency, firefighters always operate in focused, coordinated teams. There is a clear command structure that facilitates the effective flow of commands and information. 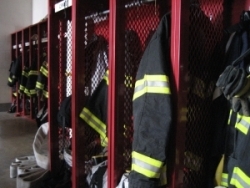 Firefighters and officers are trained in the various roles they may find themselves in and the associated responsibilities. The fire department is operated on the assumption that the worst can happen at any given time. Firefighters respond at any time day or night, during the week and on the weekend, holiday or not. In the event that more firefighters are needed, the department has mutual aid agreements with neighboring departments, who will be paged-out on request to respond to a fire scene. In the case where there is an event being attended by most of the department, a crew from a neighboring department will be brought in to stand by at our station to handle any calls. Trucks and equipment are checked on a regular basis to ensure their proper operation in an emergency. All trucks and equipment are left in a state of readiness so they can be put into service at a moment's notice. 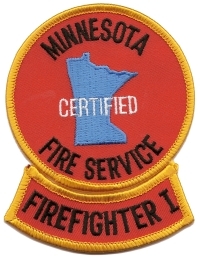 All members of the fire department are trained and certified in proper fire suppression techniques and use of fire department equipment. We all undergo continuous education and attend drills to keep the knowledge fresh in our minds. Experience is sought from veteran firefighters and new, industry-standard practices are integrated to ensure the best possible outcome. Fighting large structure fires is a specialized task that requires specialized equipment. From the city water supply, the trucks, the hoses, the nozzles, and right down to the firefighter's protective gear, the department maintains a standard of quality that puts us in the best position to do our duties to the best of our abilities.